The Auror team has just wrapped up its largest trade show to date at NRF Protect: the biggest trade show for Loss Prevention professionals in North America. More than 1,000 attendees were on hand to discuss the latest trends in store and staff safety, anti-shoplifting techniques and technology, and talk shop with other industry professionals. For Auror, this was a big opportunity to explore the U.S. market and learn more about the trends and challenges facing retailers there, while also showcasing the Auror platform and our unique approach to stopping crime in-store. - Retailers have been let down by other case management providers that have been under-investing in their systems that don’t deliver what the retailers need to stop crime in-store, keep people safe, and reduce losses. - Some retailers have built their own case management system, but recognize that without ongoing investment, they’re unable to keep pace with advancing technology. - Retailers need to unify their cameras, analytics and case management systems into a single workflow. Right now they’re juggling information in too many places, without a single view of how it all fits together. 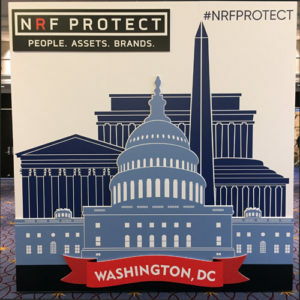 In all, it was a hugely valuable experience for Auror that will help further hone our product and approach for the U.S. Expect to see further updates from the team over the coming months, and we’ll be back again for NRF Protect 2018 in Dallas.